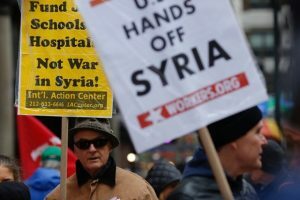 Major Attack on Syria Approaching? He warns that a similar plan may be unfolding in Syria: “September 2018 is likely to witness another tripartite aggression based on pretexts and plotting, this time involving the U.S. alongside the U.K. and France. The victim now is Syria. “The three governments in April staged a rehearsal for the upcoming performance, responding with bombing raids to the alleged use of chemical weapons in Douma. While Plan A for the raids involved heavy attacks on presidential offices and armed forces command and control centers, President Donald Trump was reportedly talked down from this by Secretary of Defense James Mattis, concerned by the prospect of possible clashes with Russia and risks to U.S. forces stationed in Syria. “Were there any doubt that skulduggery was afoot, it was removed by media reports, based on Russian statements and briefings, of the White Helmets being on maneuver in the vicinity of Jisr al-Shughur, and the transfer to a nearby village of canisters of chlorine, under the direction of English-speaking special forces or contractors. “Simultaneously, reports appeared of the U.S. bolstering its naval presence in the Gulf and land forces in Iraq on the borders with Syria. Russia has moved more of its naval forces into Syrian territorial waters in response to the warning of imminent action, say reports.